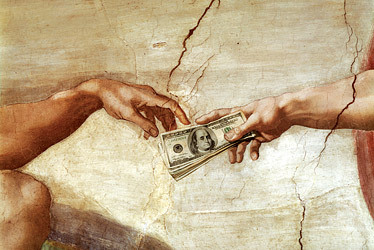 The term “Prosperity Gospel” raises a lot of eyebrows, and has been the subject of great debate. It seems that most people are on one side or the other of the prosperity fence. You have one side shouting that we should have EVERYTHING, and the other saying we should have NOTHING. I’m concluding the DNA Series this week at Faith Renewed & I’m dealing with what we believe in this area. TRUE PROSPERITY IS BEING IN GOD’S PRESENCE. Jesus came, lived, died, rose, & is coming again, so that we can be with Him forever. Just because some ministers have perverted The Message & abused people, doesn’t change the fact that God does desire to bless His people. We need to be clear on the PURPOSE of prosperity. We are blessed TO BE a blessing. It’s not about you! God has made provision for us in each of these categories, but we have to access them. HE LOVES YOU! Receiving that love is the greatest blessing you can have. Those are a few of my thoughts. What are yours? ← Some Times You Just Got To! This is good, Pastor Terry! We can make anything out of balance. Paul had learned how to be content in every state, whether abounding or not – a lesson we all could learn! God does desire to bless us, but when we go through times of testing we cannot fail to persevere. God is faithful! So true Linda! Thanks for sharing!